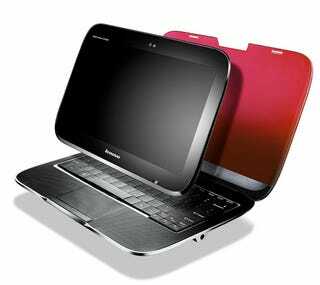 I'd buy the Lenovo U1 hybrid notebook/tablet, IF they can work through all the hiccups. I'm not quite at a point where I'm ready to commit to a tablet as a standalone device, but having two-for-one functionality really appeals to me, as does the form factor. If the final version—and the price!—end up in line with my expectations, I'm there. I'd buy a Mac after being surrounded by them (and I did)! But other than that...hmm...honestly? I'd kinda contemplate buying a Que. Horrid, I know, because they're terribly overpriced for readers, but I like the size and feel. And after groping so-so-so many readers during the week, it's the one that just felt RIGHT when held. Yes, I'm romancing an ebook reader, but I don't really care about browsing the web or all the other flashy junk on the other readers. I just want something that I can snuggle up with in the evening and read. This is the only thing I want to buy in 2010. It maybe huge, and it may be expensive, but what you're getting—top and side jets, two handheld sprayers, a massage tub, towel racks, speakers, built-in lights, a touchscreen, an LCD TV and even fans to ventilate your shower time, it's better than any shower I have ever seen, anywhere. Also, I'm dirty. After the demos at CES, I have to admit that I'm intrigued about 3D TV - especially since I watch a lot of sports and movies. As long as the price isn't outrageous, I would definitely consider picking one up. I remember a few of us talking giddily about this thing in one of our hotel rooms, then checking back to see how its news post was doing, and laughing about how little people seemed to care about it. For what we do, though, it's awesome. The other thing I'd buy is a handle of vodka, for this guy. I hate myself for wanting something with such an unfortunate name, but for anyone after a cheap Flip Mino-esque camcorder this year, the Bloggie is perfect. It shoots 1080p, does amazing panoramic video, and is super cheap. I will rename mine "Bob" though. Seamlessly swapping between backlit LCD and an e-ink-like reflective mode, this otherwise ho-hum tablet is equipped with the screen that the entire CE industry is excited about (with reason). We simply shouldn't need two devices to browse the web and read books, and soon enough, we won't. Sony Blu-ray player with iPhone app controller. I don't even know if it's practical, I just know that I want to be able to control all my home electronics with my iPhone, so bring on the apps. A new phone, probably an Android phone. My iPhone contract is up in July, and I'm done with AT&T, so I'll be looking for whatever the best alternative is on a network such as Verizon or T-Mobile. If there isn't a Verizon iPhone by then, which there probably won't be, I'll be grabbing the best Android device available at that point. I've been waiting for it since Newton got cancelled. Expanding on the success of the iPhone interface, the tablet is the herald of a new computing era, one without desktop metaphors and silly folders. It will be to the Mac what the Mac was to the IBM PC. I'm going to the Dominican Republic for a wedding this summer and the bride and groom are buying a bunch of Flip cams for various people to capture footage with. If the Kodak Playsport is available by then I'd recommend it over the Flip so that everyone could capture some nice snorkeling video and parents wouldn't have to worry so much about kids breaking the darn things. I'll buy a new phone cause mine will be two years old, and two years is a really long time to have a phone, and when it gets slow I want to toss it through a window. Probably the next iPhone, but at the rate Android's evolving, maybe I'll throw in with it finally. And Project Natal—that's unavoidable, assuming it comes out this year. I watch a ton of video on my computer—some I download, some I stream, some I encode myself—but for some reason I've been stubborn about getting a set top box to watch 'em on my TV. I think the upcoming LaCinema HD Mini might be the one that makes me cave; LaCie's stuff always looks great, and now that they've added Wi-Fi to their media player it's pretty hard to resist.